Evil army? check! Explosions, chaos, and screen-shakes? check! A group of familiar looking heroes? check! 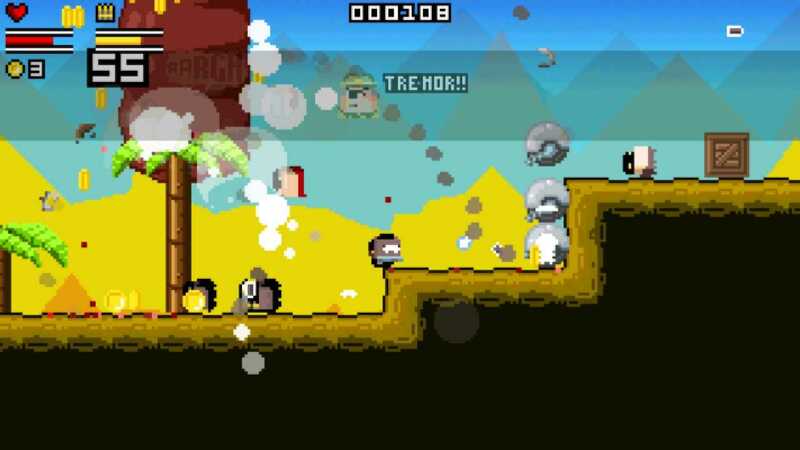 Fight the evil Black Duck army as they try to take over the planet using their technology and a huge collection of foot-soldiers. You'll get to fight on plane yards, jungles, arctica, egypt and finally the gates of Hell. Drive tanks, fly jetpacks and shoot eggs out of a chicken-gun... ..! you can extend that is by running into the Voodoo priest selling continue statues. 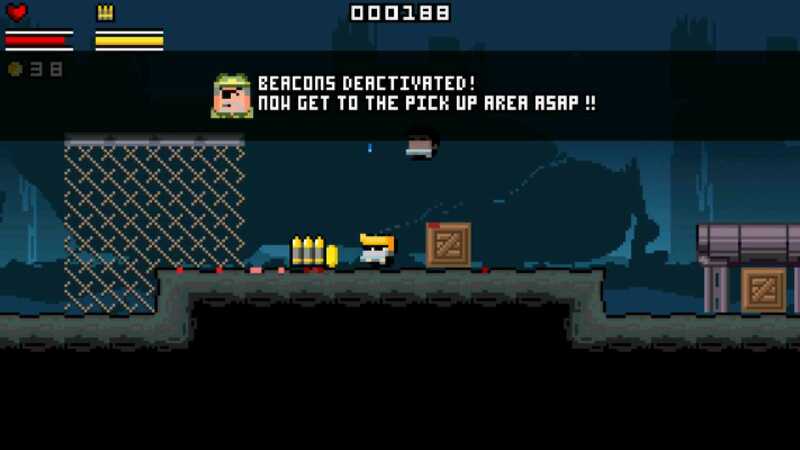 Unlock the roster of Gunslugs heroes as you go, and use them to advance your way to the gates of Hell to defeat the final boss. Collect coins to buy upgrades, improvements, and mini-games like the Donkey Kong inspired Arcade game, the Gameboy level, the train-ride, sketchbook world and much more..
you might even bump into the man with a bow-tie and a blue box..
Gunslugs is one of those funny, action packed arcade game that not only focuses on delivering great platforming excellence, but it also manages to bring in front a lot of fun, which is something that you really want all the time from such a title. The gameplay in this particular game is fun, immersive and really intelligent. Not only does the game manage to bring in front a cool range of mechanics, but it also combines multiple games into a single one. You have GameBoy elements here which for me is something extraordinary, but at the same time you do get 8-bit related graphics and a whole bunch of other stuff that adds up to creating something extraordinary and exciting. 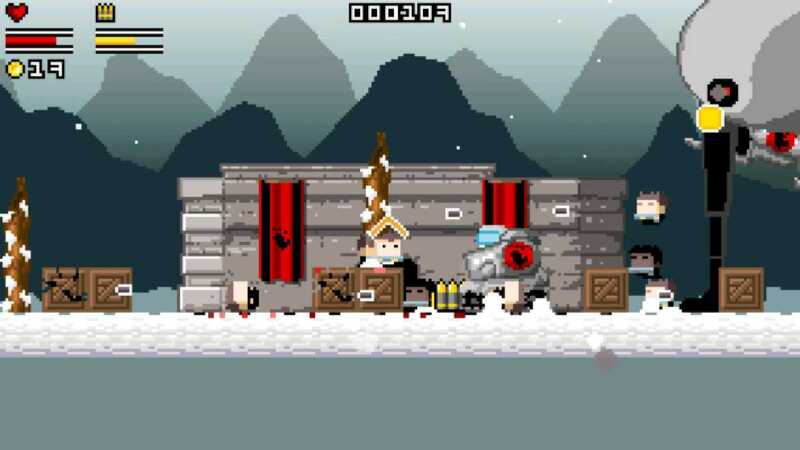 Graphically, Gunslugs won’t win any awards, but the 8-bit graphics really have style here and I enjoy the way they were created. You will like how fun and interesting the level design is, and the characters are also portrayed in a very different, exciting manner. The game literally screams pop culture and it manages to bring in front so many references to the older titles, all while remaining true to its own self. 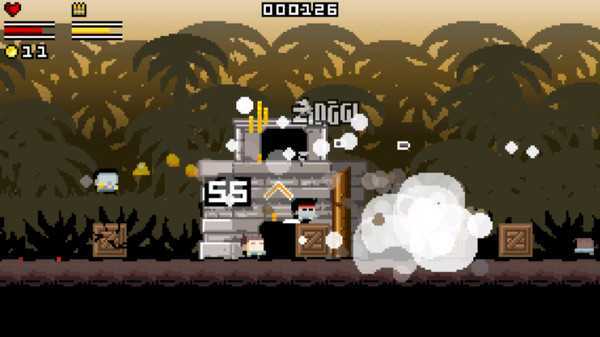 Gunslugs caught me off guard, as I did not expect to encounter such a good game. It does have its flaws, true, but for what it is, this game really manages to make you feel fun unlike never before. It’s really different to what you would expect to see on Steam, and this is one of the main reasons why you should check it out, as it’s really well worth your time. Don’t hesitate and give it a shot, it’s inexpensive and offers a ton of value!